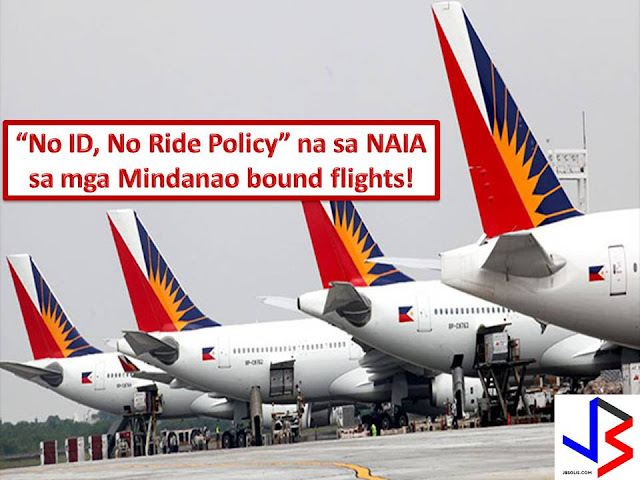 With 60 days period of Martial Law is still in effect in Mindanao, the Philippine Airlines (PAL) is implementing "no ID, no ride policy"
So if you are going in Mindanao and flying with flag carrier of the Philippines you need to present a valid identification card during check-in and pre-flight boarding. PAL spokesperson Cielo Villaluna, the implementation of the policy is part of intensified security measure and to prevent possible terror attacks at Ninoy Aquino International Airport. Airports in Mindanao has been placed in security condition 3 while another airport in the country is in security condition 2. Additional policemen were deployed and police desks put up at NAIA terminals to assist passengers. In Philippine Airlines (PAL) Advisory dated May 26, 2017, the airline is reminding passengers to present one valid ID during airport check-in and pre-flight boarding. It says that this is a security measure aiming to ensure the integrity and safety of all PAL flights. The airline is hereby requesting for the full cooperation of its passengers. The airline said earlier that passengers heading to Butuan, Cagayan de Oro, Cotabato, Davao, Dipolog, General Santos, Ozamis, Surigao, and Zamboanga may opt to rebook their tickets from May 24. Superintendent Sheldon Jacaban, Philippine National Police-Aviation Security Group chief, ordered heightened security at airports across the country to ensure the safety of air travelers after President Duterte declared martial law in Mindanao. Jacaban also urged the public to report suspicious-looking individuals and packages abandoned at the airports.